Delivering an easy upgrade for MotorGuide trolling motors lacking integrated GPS, the pinpoint GPS navigation system utilizes an advanced GPS receiver and precision control algorithms for incredibly accurate operation. A compact, easy-to-use remote controls anchor, heading lock, jog, route record/playback and cruise control. 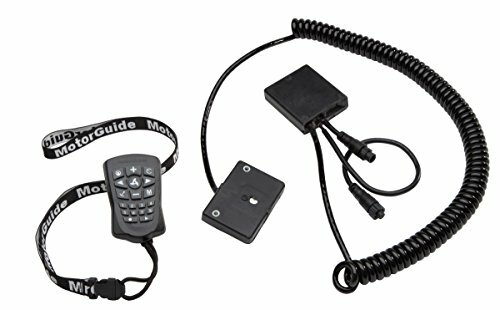 MotorGuide is dedicated to innovating, engineering and manufacturing electric trolling motors and accessories for both freshwater and saltwater environments. Proudly setting the standard for quiet and reliable operation, our products provide anglers with precise propulsion for superior boat control. MotorGuide is dedicated to innovating, engineering and manufacturing electric trolling motors and accessories for both freshwater and saltwater environments. If you have any questions about this product by Motorguide, contact us by completing and submitting the form below. If you are looking for a specif part number, please include it with your message.